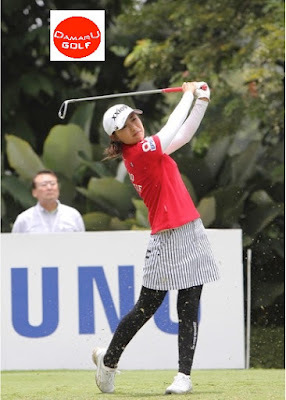 Round one of the Sime Darby LPGA Malaysia 2015 saw American Alison Lee and China's Lin Xi Yu share the lead at six under par 65, with defending champion ShanShan Feng, Yani Tseng, Michelle Wie, and Chella Choi tied one stroke behind. The field of 75 had to wait out a three hour storm as play was suspended at 1:27pm, and restarted at 4:32pm. Q. Tell us, what was the round like for you today? MICHELLE WIE: Seemed like it was up and down. Made two birdies in the beginning and made a bogey on 3 and just seemed like it was kind of going back and forth. But it was fun out there today. Obviously the rain delay was a little unfortunate, but it almost helped me. I got on a birdie run afterwards. Q. Most people lose momentum after the rain. That didn't seem to happen to you. MICHELLE WIE: Yeah, I guess so. I made three birdies in row on the back nine, made a bogey, and then the rain delay kind of got up. Got a chance to regroup. Just got to stay patient in those kind of situations. Q. Are you still pumped from that Solheim Cup victory? MICHELLE WIE: For sure. I definitely am. It was awesome. Looking back on it, it was just so good. Q. How are you physically health-wise? MICHELLE WIE: It's been a tough year with the body, but, yeah, I feel really good. I'm playing five in the Asian swing. I didn't play too much of the year with my injuries. But I feel great. Hopefully I can stay that way and maintain that. But I feel good health-wise. Q. What really got going there that final round at the Solheim Cup? What was it, eight birdies in 14 holes? MICHELLE WIE: Uh-huh. I went out there just determined, you know, and was a little angry. The last two putts we were down. It was kind of reminiscent of 2013. Same score. We just didn't do it. I knew that I just was really angry that I didn't get my point in 2013 against Caroline actually. I wanted to go out there and I was pretty determined. Felt great. Q. Was that the best you've felt all year on this back nine coming in there? Was it six birdies in seven holes? MICHELLE WIE: Yeah, since Evian it's been feeling really good just health-wise. Not even game or anything. Just feels so good to be out here and not thinking, Oh, this swing is going to hurt my hip and my ankle. Just going out there and being actually able to hit balls and hit golf shots and play the way that I know I can. Q. How big was up and down on 17? MICHELLE WIE: It was huge. I hit a horrible iron shot. But, you know, makes it interesting. Yeah, that up and down felt great. Q. I know you've on the situation Allison is of trying to do school at a major university and play professional golf. What's that like? MICHELLE WIE: It's hard. We've talked a lot about it. She just joined a sorority, which I was really proud of her for doing. I'm proud of her. We're both the same major. UCLA is a great school, and it's kind of her passion. Her goal, her dream was to graduate from college, so I commend that a lot. She's smart and definitely handling it great. Q. She kind of remind you of a younger you in a sense? There are some similarities there for sure. MICHELLE WIE: Yeah, I mean, I guess she says a lot of people think she's me, recognize her as me. We're both tall, Asian, I guess. She's smart. She's great and a great player. I'll do anything I can to help. Q. What did that first Solheim Cup do for you? You won that year right after that. You think it could have a similar effect for her? MICHELLE WIE: For sure. I think it can have a lot of the effect. Same for Gerina, for a lot of the players. I always feel like even after 2013 Solheim Cup for me, that really turned things around. You just have to play in such high pressure situations and try to pull shots that you usually don't, so when you do actually pull them the confidence level raises. I think it really will help everyone. Hopefully all us Americans hopefully get some wins in the end of the year. thing that I've got going with my body. I just want to be injury-free. If I can just keep injury-free for 2016 as well, then I just want to try to rise in the word rankings and try and get back in the Top 4 for the Olympics.